One of the new features in the gemstone section is the "Gemstones in the rough" - which shows the gemstones in their native original, unprocessed form. Whenever possible we tried to show samples of pieces that are used by cutters in the gem trade. Finished Quartz and all its varieties! This is huge news. The MOST comprehensive mineral in this guide, by FAR, is Quartz. With HUNDREDS of varieties/subvarities, and in so many forms, colors, and styles, this took a very long and grueling time to complete. We seperated Amethyst and Citrine into their own pages due to the many individual varieties, images, and individual localities for these. We also seperated Chalcedony, Agate, and Jasper into individual mineral entries for this same reason. All this is done now. Next are the other Quartz polymorph's Tridymite and Cristobalite. These should go very quick! I made my first trip to the Tucson show this year. I wanted to scoop out the situation there and meet with dealers to see what it's all about. It was sort of a prep trip so that next year when the new website is live I'll really be familiar with the scene, and know where to go and what to expect. Tucson was great - the weather was great (except for one of the days that had a dreching storm with wind-driven rain that caused all outdoor dealers to be on edge), especially when coming from the dead of winter in New York. I arrived on Wednesday morning in Tucson. I went first to the Pueblo show, then to the Executive Inn show, and then to the Inn Suites. Met alot of dealers, bought a few bargains, and got the feeling of Tucson. On Thursday I went to the main show, and then headed to the shows by the La Quinta, Howard Johnson, and Travelodge, before calling it a day. Friday I had to pack up and head back to Phoenix. Overall it was a great learning experience. 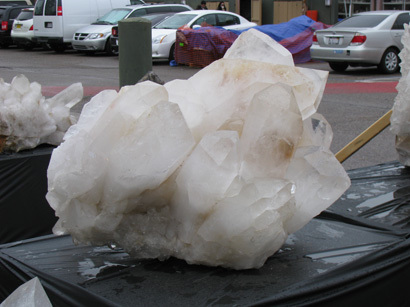 This Quartz cluster from Brazil was not that much smaller then the cars in the background!